Infinite Art Tournament: March Madness: North and West Finals!!! The Rules: For each of the pairs of flags pitted against each other, indicate your favorite. Explication, derision, and/or analysis will not affect the scoring, but is nevertheless encouraged. 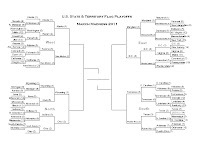 Each winner will advance to the Final. North and West Finals Voting Deadline: 9 p.m. PDT, TOMMOROW, Wednesday, March 23. South and East Finals Voting Deadline: 9 p.m. PDT, TODAY Tuesday, March 22. O-HI-O has a cool flag. New Mexico should top Alaska, you betcha! Ohio and Alaska. I'd be tempted to vote for Wyoming if they didn't include the seal, though. I just do NOT like Ohio today, though it's possible I voted for it in earlier rounds, so even though I'm not overly fond of the USDA-approved beefalo, Wyoming it is. New Mexico. No, Alaska. Changing my vote midstream. 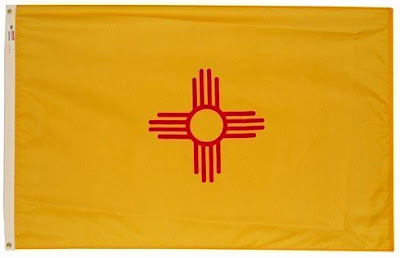 New Mexico looks depressingly like a bullet wound this morning. Man, I got up on the wrong side of the bed or something. Ooooh... tough race. 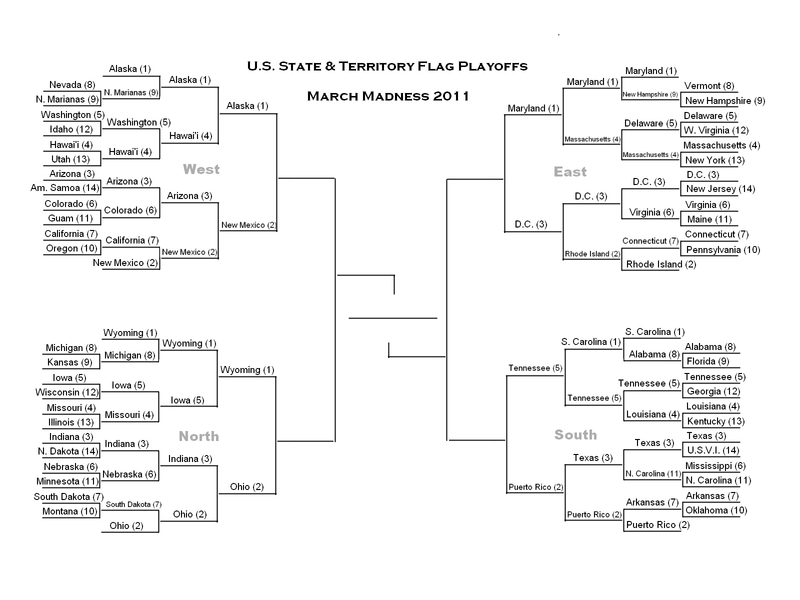 I'd pick either alaska or new mexico over wyoming or ohio. Gah... New Mexico. It's warmer. Wyoming and Ohio are both tragic in different ways. My vote is for Wyoming. And Alaska and New Mexico are both perfect in different ways. 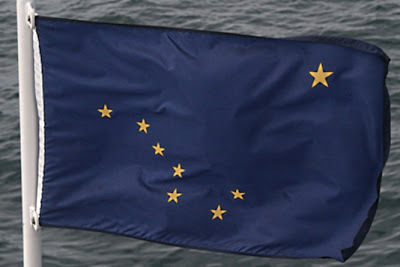 My vote: Alaska. Red white and blue are certainly the colours to have in this category. Ohio is hurt by the poorer lighting on its entry, but I'll try not to let that influence me, as I likewise will ignore the watermark on Wyom--oh right, that's supposed to be there. Nice bison. Shame about the stamp. Wyoming and Ohio should merge, so they can have a red white and blue flag with a buffalo, stripes, stars, and a seal in the middle of the triangle. 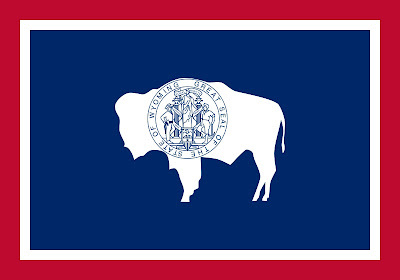 Or how about fewer stars, no seal, and the buffalo facing right? I'm having a hard time picking one, so I'm taking my time and picking on both. Okay, I've got it. 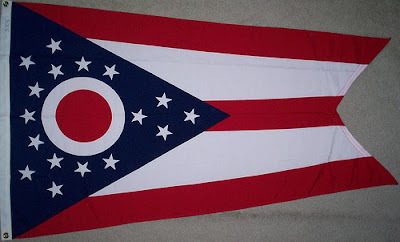 Wyoming for a bookplate, and Ohio for a flag. So it's the blue banner with Ursa Major and Polaris versus the yellow banner with a red sun. Flapping on a flagpole I bet it's just blue versus yellow. I feel as though I should vote for the one that is a celestial naviagation lesson on a pole, but my gut wants the yellow one, and flags are all about emotional appeal, not education. 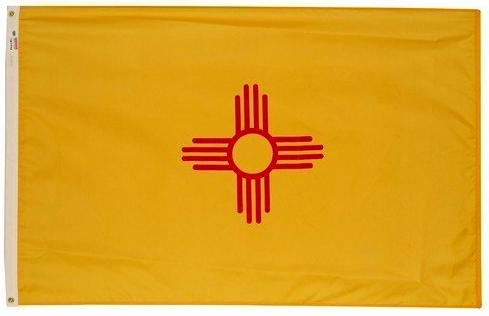 It's New Mexico. Ohio over Wyoming. The seal on the bison reminds me of the FDA stamp on beef. I love both of these. Either one of these could go all the way if they weren't meeting here. Oh well. Let's go with Alaska. This one's tougher. New Mexico has better colors (for something seen against the sky, anyway) but the petroglyph-thingie seems undersized and perhaps unimaginitively centered. 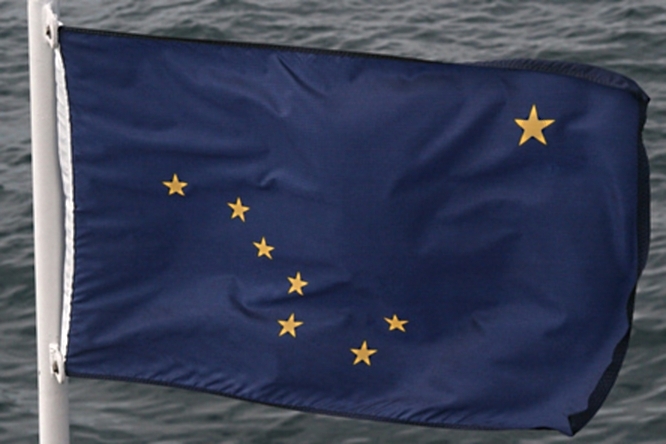 I'll go with Alaska, for that inspired romantic act of restoring an overused symbol to its home in the night sky.